Advanced Threat Protection System - 4 x GE RJ45, 2 x 10GbE SFP+ Slots, redundant PSU, 4 licensed VMs with Win7 , Win8 , Win10 and (1) MS office licenses included. Upgradable to a maximum of 24 VMs, refer to FSA-2000E-UPG-LIC-10 or FC-10-SA20K-176-02-DD SKU. Fortinet’s top-rated FortiSandbox is at the core of the Advanced Threat Protection (ATP) solution that integrates with Fortinet’s Security Fabric to address the rapidly evolving and more targeted threats across a broad digital attack surface. Specifically, it delivers real-time actionable intelligence through the automation of zero-day, advanced malware detection and mitigation. Native integration and open APIs automate the submission of objects from Fortinet and third-party vendor protection points, and the sharing of threat intelligence in real time for immediate threat response and reduction on the reliance on scarce security resources. FortiSandbox and other advanced detection techniques step in to detect “Zero-day” threats and sophisticated attacks, delivering risk ratings and attack details necessary for remediation. Complement your established defenses with a two-step sandboxing approach. Suspicious and at-risk files are subjected to the first stage of analysis with Fortinet’s awardwinning AV engine, FortiGuard global intelligence query*, and code emulation. Second stage analysis is done in a contained environment to uncover the full attack lifecycle using system activity and callback detection. Figure 1 depicts new threats discovered in real time. In addition to supporting FortiGate, FortiMail, FortiWeb, FortiADC, FortiProxy, FortiClient (ATP agent) and Fabric-Ready Partner submission, third-party security vendor offerings are supported through a well-defined open API set. Reports with captured packets, original file, tracer log, and screenshot provide rich threat intelligence and actionable insight after files are examined. This is to speed up remediation. 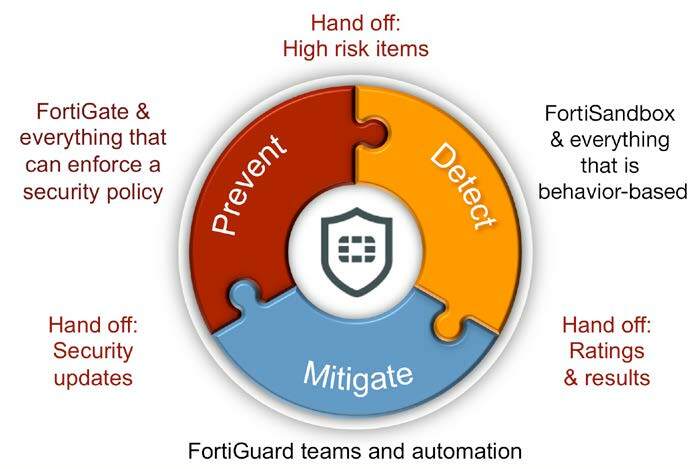 Fortinet’s ability to uniquely integrate various products with FortiSandbox through the Security Fabric offers automatic protection with incredibly simple setup. Once a malicious code is identified, the FortiSandbox will return risk ratings and the local intelligence is shared in real time with Fortinet and third-party vendor-registered devices and clients to remediate and immunize against new advanced threats. The local intelligence can optionally be shared with Fortinet threat research team, FortiGuard Labs, to help protect organizations globally. Figure 3 steps through the flow on the automated mitigation process. FortiSandbox supports inspection of many protocols in one unified solution, thus simplifies network infrastructure and operations. Further, it integrates within the Security Fabric adding a layer of advanced threat protection to your existing security architecture. 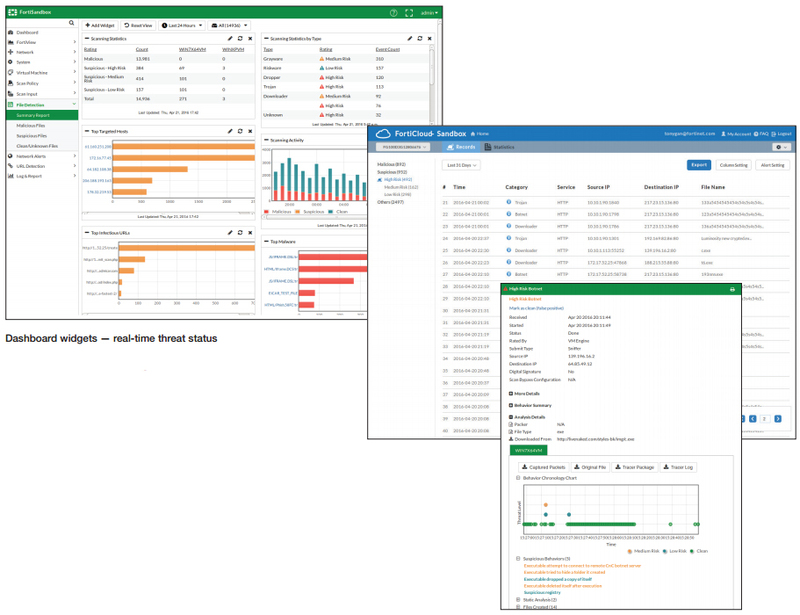 The FortiSandbox is the most flexible threat analysis appliance in the market as it offers various deployment options for customers’ unique configurations and requirements. Organizations can choose to combine these deployment options. 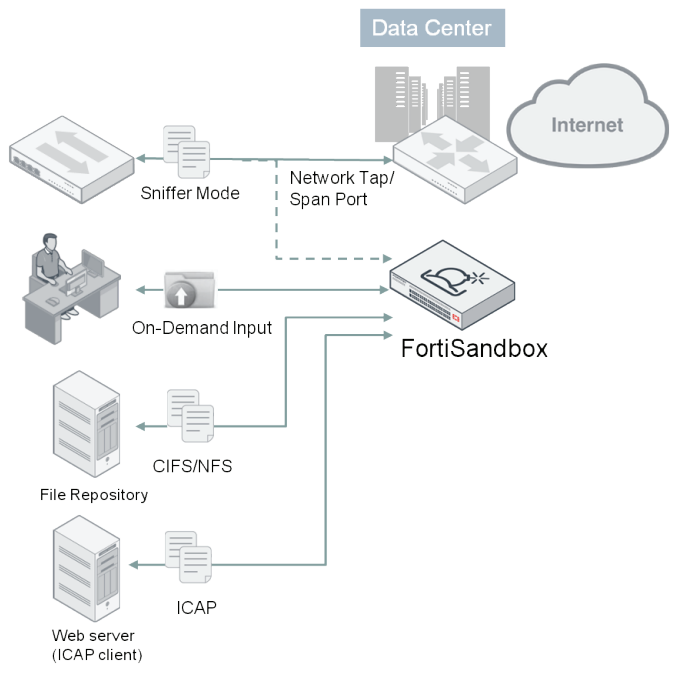 This FortiSandbox deployment mode accepts inputs as an ICAP server or from spanned switch ports or network taps. It may also include administrators’ on-demand file uploads or scanning of file respositories via CIFs or NFS through the GUI. It is the ideal option to enhancing an existing multi-vendor threat protection approach. 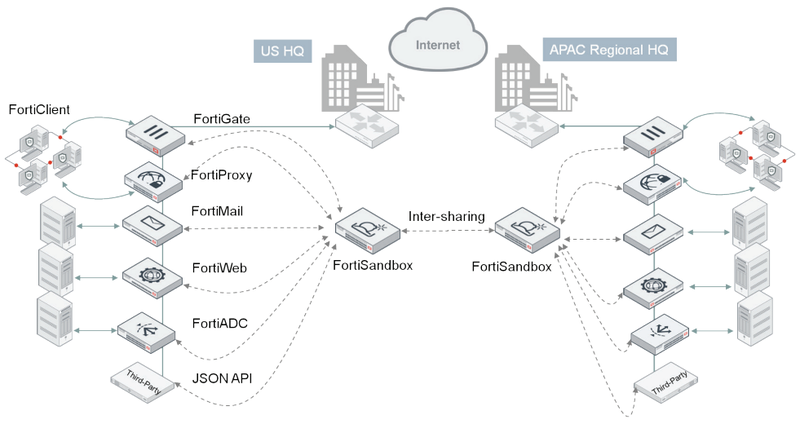 Fortinet products, such as FortiGate, FortiMail, FortiWeb, FortiADC, FortiProxy and FortiClient (ATP agent) and third-party security vendors can intercept and submit suspicious content to FortiSandbox when they are configured to interact with FortiSandbox. The integration will also provide timely remediation and reporting capabilities to those devices. This integration extends to other FortiSandboxes to allow instantaneous sharing of real-time intelligence. This benefits large enterprises that deploy multiple FortiSandboxes in different geo-locations. This zero-touch automated model is ideal for holistic Figure 4: Standalone Deployment protection across different borders and time zones. 1 FortiSandbox pre-filtering is powered by FortiGuard Intelligence. 2 Measured based on real-world web and email traffic when both pre-filter and dynamic analysis are working consecutively. 3 Measured based on real-world email traffic when both pre-filter and dynamic analysis are working consecutively. * 2(FSA-500F)/2(FSA-1000F)/4(FSA-2000E)/8(FSA-3000E) Windows VM licenses included with hardware, remaining are sold as an upgrade license. Expands FSA-2000E licensed VM capacity by 10. Includes (10)Windows and (2)MS Office licenses.